Bye Bye Winter and Hello Spring! Although here in Florida there is not much of a season change, we are excited that Spring is here. 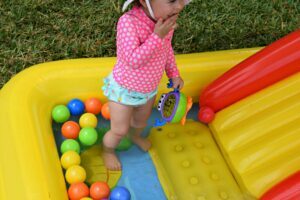 I wanted to share some of favorite Spring time outdoor essentials. My daughter is like many children who are afraid to take a break from the outdoors because she feels she will miss out on a moment of play time. I have to ensure that she is getting enough water and food to sustain her energy while playing. Nuby was gracious enough to share with me some products that are available through Babies R Us. 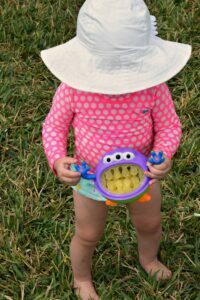 The iMonster snack keeper is one of my daughters favorite ways to toting her snacks around. Since she is always on the move, this iMonster ensures that her snacks don’t end up as part of the 5 second rule or floating in her pool. One way that I ensure that my daughter has energy without junk foods and with food that is “good on the go”, I give her fruit. Since I am always up for a bargain, I stocked up on two tubs of the Publix BOGO cantaloupe recently. Problem is, that here in South Florida, it is hard to keep things cold while outside. A tupperware sitting on top of ice works for about 30 mins then the ice is melted and you have a hot piece of plastic holding your foods. No thank you. 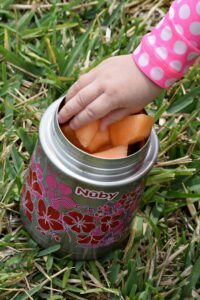 Instead I throw her fruit into her Nuby insulated thermos. The thermos has come a long way since my day. A thermos used to be known for your soups and spaghettio’s. Not any more, this Nuby thermos keeps food warm for 6 hours or cold for 7. There’s no worry about keeping her fruit cold and readily available. Plus the thermos itself doesn’t get hot and is cool to the touch, perfect for my little one! Last up on my essentials is the GCap. 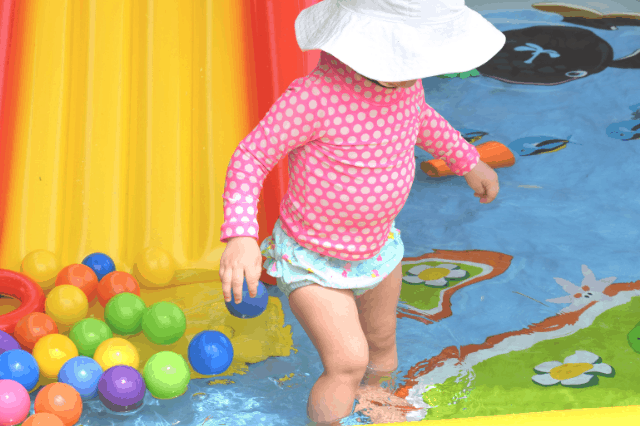 The GCap was designed with toddlers and young kids in mind. 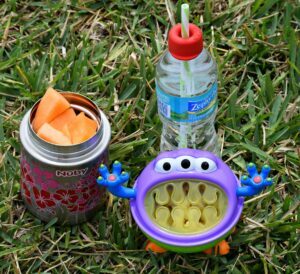 Simply put, it is a stretchable and reusable bottle cap that fits any sized bottle drink to prevent a childs spills. 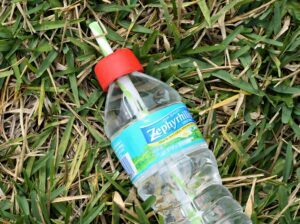 I simply put the GCap on a water bottle, add an adorable straw and there is no more mess or wasted drinks. My daughter gets the water that she needs to stay hydrated and when she knocks it over or drops it, there are no spills. 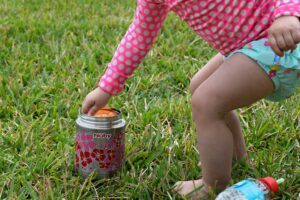 There you have it, my Spring time essentials for your little ones when taking on the outdoors. Have any recommendations that you think I should try? Check into my Instagram account soon as well. I will be doing a giveaway of a GCap for a fellow mommy who is interested!